Mik has never wanted to see the Fantasmic show, but he is a foodie, so when I told him we could get reserved seats and a dessert platter to watch the show he decided to give it a try. It certainly is not cheap at $60 a person, but you do get a chair and even if you do end up in the second or third row there is adequate room to shuffle chairs a little so you can see in between heads in the front row if they happen to be tall. We got in line about 15 minutes before they started letting you choose seats. It is kind of annoying that for the first showing you have to then go and wait for them to let in the area, especially with the area so congested and not much room for hanging around the ~15 minutes. Mik sat in the front row (they took away the chair) and we sat behind him in the second row. The view was not bad, but there was a pole in the way. You would think if you are paying $60 for seating they would line the seating up so there was not such an obstructed view. Not too big a deal, as you could still see pretty much everything. The dessert tray is great. 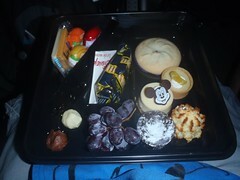 Each person gets a box filled with various desserts along with cheese and crackers. There were some little truffles, a little cheesecake with a Mickey chocolate, a cool cookie with a purple starry chocolate bottom, a brownie, grapes, Babybel cheese, crackers, and probably a few other things. 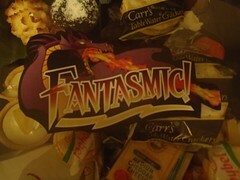 The lid is cool with the Fantasmic logo, but it does not stay on very well (the CMs are nice and told us this when handing them out to best avoid spills). You also get drinks as part of the seating. We all had hot chocolate, but they also had soda and coffee options. I loved seeing the show and having a seat instead of having to stake out a spot early or standing long before and during the show. It is also nice that it is not crowded with people smooshed together like the other areas can be. 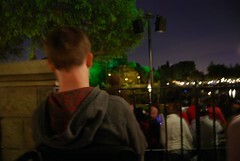 We all enjoyed the show and even Mik said he would see it again, but only if we did the Dessert seating. Certainly, not something we are going to splurge on for every Disneyland trip (i.e. not happening the other two trips planned this year), but it was totally worth it and I will definitely try to budget it in again sometime. Mik just wished they had something like this for World of Color, although maybe before we do this again we will give the Ariel's Grotto package for that, although that still is not really anywhere near the same from what I have read. 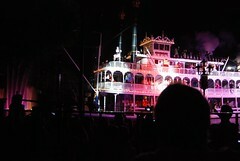 We also ended up watching the fireworks from here. The view is not that great, but you do still at least see Dumbo and Tinkerbell flying. The trees around the seating blocked seeing much of the actual fireworks, but it was better than trying to get out of the park during the fireworks.